It has also been clarified that it is impossible for the whole of Israel to come to that great purity [complete correction of egoistic intentions] except through the study of Kabbalah [in the group with the right intention], which is the easiest way adequate even for commoners [regardless of one’s level of development]. However, while engaging only in the revealed Torah [rather than Kabbalah], it is impossible to be rewarded through it, except for a chosen few and after great efforts, but not for the majority of the people [who are not yet ready to go through affliction for the sake of correction of egoism]. Just Be Ready To Unite! It is not important where we begin to read The Zohar from, what item, or what part of it. Even if a person listens to the lesson for the first time, it is absolutely unimportant. “There is no time in spirituality”; the Torah speaks of spiritual states, all of which occur within us, but we do not perceive it yet. It is completely irrelevant, though. We need to awaken the Light inside The Book of Zohar, the most exalted, true, and powerful source. No book even comes near to The Book of Zohar‘s influence on the soul. The only way to draw its Light upon us, for it to have an effect on us, is by obtaining qualities similar to it. Therefore, we are reading The Book of Zohar together. In other words, each of us has to prepare himself to be in connection with the others from the beginning, even before we open The Book of Zohar. This is what is said about the giving of the Torah: If you agree (obviously, that we cannot do it, but we agree nonetheless) to become “as one man in one heart,” to achieve brotherly love (in the future), then you will receive the Torah, meaning the method of correction by way of the Light that Reforms. Then, that Light will return you to the Source, to the good, to equivalence with the Creator. That is why when we are reading The Zohar, we have to always strive to meet this condition: Be ready to unite so that the Light will influence us, unite us, and we will reveal the Creator in our unity as in one common soul. An individual soul, after all, can only feel our present reality, the one that we are currently perceiving. Freedom starts at the point where I make a decision as to whether I am governed from Above or not, whether the Creator exists or not, and whether I depend on Him 100 percent? If not, then what does freedom mean? If there is no freedom at all and we cannot change anything, then there is nothing to think about. However, if we are capable of autonomous actions, then what are they? Here is the point at which I begin to clarify why I live, what is the essence of my life, what will happen to me further, and what is the use of my life. In other words, I would like to know if I am managing my own life and whether I can modify anything in it. These questions emerge at a “speaking level” in a human being. The whole clarification is about whether I can act on my own and contest the Creator (nature) that governs everything there is. Is there a “free” point outside of me that doesn’t belong to nature? At a regular, animate level of this material life, we cannot change anything, and, therefore, it is so predictable. However, not a single fortune teller knows what will happen in the Upper life, at the “speaking” level, within our connection with the Creator, our freedom. A fortune teller can guess only what might happen at the level of this world, with our physical body. Below the Machsom (the barrier separating us from spirituality), there exists no freedom of will whatsoever; it subsists only in spirituality. An animal doesn’t possess any freedom of will at all, so why would our physical body be any different? However, the soul exists beyond this level and obeys different forces that are present in another world, another dimension. We can only speak about freedom in relation to the soul. What kind of freedom can exist in this world if our biological bodies are rigidly governed by pleasure and affliction? Freedom of choice exists only in spirituality in the “middle line.” Don’t waste your energy for material things that are beyond your prime necessities. You won’t get anything worthy from this bodily life, and if you persist in demanding more than you really need, you only make your life more complicated. However, if you use your vigor to attain spirituality, you will win. This is the law of nature: You have to provide for a normal material existence, but the rest of your energy and intellect has to be devoted to attaining spirituality. That’s where you will find genuine fulfillment. Laitman.com Post: How to Change One\’s Destiny? Our soul is divided into two parts: Galgalta ve Eynaim (GE) or 248 desires, and AHP (Awzen, Hotem, Peh) or 365 desires. We have to correct the desires of GE to “bestowal for the sake of bestowal” and then AHP to “reception for the sake of bestowal.” Our freedom of will lies between them, in the middle, in the special area called the middle third of Sefira Tifferet. Above, in GE, there are Keter, Hochma, Bina, Hesed, Gevura, Hod, Yesod, and Malchut. Below, in AHP, the lower third of Tifferet, Netzah, Hod, Yesod, and Malchut. Between them, there is the middle third of Tifferet called Klipat Noga (the Noga Shell), the very place of our free will. It is like a narrow neck in an hourglass. Above it, there are our desires to bestow, beneath it our desires to receive, and in the middle, between bestowal and reception, I am left with an empty space. It is not ambivalence when I don’t know which egoistic fulfillment to favor and choose; rather, it is a passage to a totally new space, a new dimension. If I find and step through it, then I will live there in one dimension with the Creator. Through this narrow tunnel, we are brought into the new world as if we are born from the mother into the world and realize our free will. Question: What if my duty is to be a security guard during a lesson at the convention? Everyone is sitting and listening to you while I am outside checking passes. Even if I get to listen to the radio broadcast in my headphones, it is not the same thing. Answer: This is your “earning.” After all, you are serving others: Everything they “catch” at the lesson is organized and provided by you. In other words, at that moment, they are receiving fulfillment because of you. Question cont. : But how is that when I do not receive any of their impressions? Answer: On the contrary, all their impressions come through you from Above. It is as if you were receiving everyone’s rewards. Not bad, eh? Question cont. : But what if I am on duty as a security guard, and I am enjoying it because I am helping disseminate Kabbalah? Is it all right to receive this type of fulfillment? Answer: Go ahead, receive your fulfillment. Overall, perform less theoretical calculations. An action is an action. Question cont. : Let us say that I came to the convention, I do not have a desire to work in the kitchen, but I was given the responsibility of peeling, like, a hundred pounds of onions, a half-day’s work. I do the work without any desire, I am disgusted, I feel woeful, I keep cursing my friends and the entire convention, and keep wishing to run away every coming moment. Answer: Just take a look at the enormous work you are doing. Look at the thoughts about the importance of the group and the goal that are running through your head every second of your work with these onions. Look at the amount of calculations that you need to make in order to stay in the kitchen all these hours. You will think so many things over, you will figure out your attitude toward friends and the Creator, you will fight yourself, suffer, and, in the end, you will see that there is no other place for you. Where else would you do all these examinations? In situations like this, the precision of the analysis is very high. Thoughts and apprehensions start falling over you as soon as you begin any kind of work from the most to least pleasant. This is a wonderful opportunity. If everyone were able to work in the kitchen while listening to the lecture, I would stay in my room and do a radio broadcast without a camera. Even if there were no need for people in the kitchen, it does not matter as long as there are disturbances and the ability to overcome them. This is the best condition for advancement. Question: Can I hasten the unfolding of the Reshimot (spiritual records, genes), or is it a constant value? 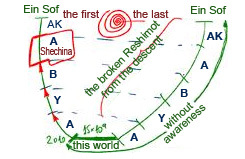 Answer: We descended into this world from the World of Infinity (Ein Sof) through five worlds, and from this world, we must now ascend back to the World of Infinity. Baal HaSulam describes this quite in detail in the Introduction to The Book of Zohar. On the way downward, the Reshimot broken in the process of the descent remain within us. This world has existed for fifteen billion years, and today, in 2010, we are the first to start the ascent, our correction. We need to take the broken Reshimot and realize them anew in the five worlds, ABYA and Adam Kadmon. We must take the same steps, but this time, do so in the corrected way. In truth, these are not two different paths, upward and downward, but one ladder, one line. We descended it without awareness, unconsciously. Even in this world we are still completely unaware of what is going on. When we start realizing our Reshimot, we don’t know what is happening to us, until we reach a certain level, cross the Machsom (the barrier separating us from spirituality). But after the Machsom, we begin to lift Reshimot through the worlds of Assiya, Yetzira, and Beria to Malchut of the World of Atzilut which is called Shechina. In the World of Atzilut, there is a mechanism of correction. That is where we correct everything and then begin to understand, feel, and comprehend the entire process. We don’t pick the Reshimot. Everyone has a “helix,” a chain of Reshimot placed in them, and we pass through them one by one, from the first to the last. The Light will work on them if we arouse it. Hence, we can only determine the pace by which the Reshimot unfold. If I plug into the group and studies, if I think and care for it during my free time, then by doing so, I hasten the pace of my development. Besides, it absolutely doesn’t matter how many free hours I have day by day. Somebody gets twenty and someone just two, but what matters is how you use them. Everyone is placed in the setting most beneficial for him or her; it is not up to us. We, however, have to seek the most efficient use for our free time for the goal of spiritual development. This is discussed in the article “The Freedom“: One should get involved in the group as much as possible and there, in unity between us, aim all our effort farther: at dissemination and studying. These are our main actions: unification in the group and transition from unity to dissemination and study. Thereby, you awaken the Light; the rest is not up to you.